They had spent more than a decade going back and forth with their CPP ((Cambodian People’s Party)) commune chief, who had promised them government funds would be available to build an irrigation support network, crucial in monsoonal Cambodia, where wet seasons are extreme and dry seasons can be equally as harsh on agricultural land. 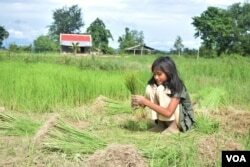 Finally, the frustrated villagers from Cambodia’s Kampot province banded together, pooled their money and built an irrigation gate to help store and control the flow of water into thousands of hectares of rice fields. “People agreed with each other that if we didn’t build it ourselves and waited for the government, we wouldn’t have it, because the commune chief said this water gate couldn’t be built using the commune’s budget,” said Ourn Sophal, president of a local farmers’ association and a local leader for the recently created Grassroots Democracy Party. The party’s members say they have lost faith in the country’s two dominant parties, and are seeking to turn Cambodia’s traditional “top down” politics on its head, empowering rural voters through political education and the development of policies through debate at the local level. With Cambodia’s commune elections to be held next June, Prime Minister Hun Sen appears to have already kicked off the campaign for his Cambodian People’s Party, which has ruled with a strong arm for more than 30 years, with a nationwide provincial tour, boasting of improvements to roads, bridges and schools under his party’s watch. The opposition Cambodia National Rescue Party, which made significant gains in the closely contested 2013 national election, has long held rallies in the countryside, with the party’s top brass traveling to rural areas, aiming to shore up votes for next year’s local elections, which are expected to act as a barometer for the national vote in 2018. Created just last year, the party is taking a long-term view, backing the spread of awareness from village to village, through “empowered” local leaders. Improved livelihoods and greater access to independent media via radio and smartphones in Cambodia’s rural areas means information is more readily available to people than ever before. “I have only seen changes in the garment worker’s wages,” said Doung Pov, a 53-year-old farmer from Takeo province, attributing the salary increase to pressure applied by the opposition. “I haven’t seen any other noticeable changes,” she said, echoing the concerns of dozens of converts attending GDP meetings in Takeo and Kampot provinces earlier this month. Starting in provinces close to the capital, GDP founders are meeting with voters who, they say, have become disenchanted with Cambodia’s centralized power structures. Party organizers are providing a platform for people to debate party policies, from local economics with a focus on agriculture, to health and education and even foreign relations. “In short, our policy is focused on rural development from the grassroots, and decentralization to make sure that each person at the commune level has enough capacity to solve their own problems, and the freedom and resources to solve problems for themselves,” said GDP co-founder Yaing Saing Koma. Koma concedes his party’s bottom up approach to local policy development and intra-party leadership contests will become unwieldy as membership expands, but is confident its 20-year vision will foster a more politically confident electorate. In July, prominent political analyst Kem Ley, whose research contributed to the formation of the GDP, was killed while drinking his regular morning coffee at a gas station café in Phnom Penh. “My son knows what is right and what is wrong. And he is going to the right way. I don’t know why I should prevent him for doing this?” he said. 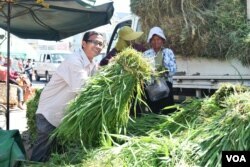 Mean Rith commune chief Oeum Tan told VOA that Long had his pay cut as he is “illiterate” and “disorganized”. “Keat Long is old and doesn’t have the power to control his son,” he said. Regardless of how people vote in the commune elections next year, many voters in Cambodia’s countryside are taking matters into their own hands. “If we lack water we need to find it by ourselves,” said Sok Channa, a Takeo farmer, who said she had not heard of the GDP, but had little time for mainstream political parties.